Besides surgery, radiation therapy, endocrine therapy or chemotherapy, which were widely used in cancer patients for decades, the 21st century has seen the emergence of “targeted” therapy, resulting from the identification of molecular pathways in cells and their alterations in tumors. An increasing number of compounds targeting specific molecules or cancer cells have been developed and, for some of them, approved by the United States Food and Drug Administration (FDA) as well as other regulators in EU and Japan Additional new and more efficient types of compounds, are still in clinical trials, but are expected to gain future approval. More than eighty FDA-approved targeted therapies are described here, along with about eighty other promising compounds. These drugs are members of various therapy classes, including tyrosine kinase inhibitors; serine/threonine kinase inhibitors; dual specificity kinase inhibitors; lipid kinase inhibitors; poly ADP ribose polymerase inhibitors; monoclonal antibodies; microtubule targeting agents; histone deacetylase inhibitors; proteasome inhibitors; antimetabolites; immunomodulatory agents; DNA methyltransferase inhibitors; hedgehog pathway inhibitors; enzymes; protein translation inhibitors; vaccines, oncolytic viruses; chimeric antigen receptor T-cells (CAR-T); and so on. A series of “companion” diagnostics intended to be used as an indication for specific therapies, and approved to this aim are also mentioned. Sacks LV, Shamsuddin HH, Yasinskaya YI, Bouri K, Lanthier ML, Sherman RE. Scientific and regulatory reasons for delay and denial of FDA approval of initial applications for new drugs. 2000-2012. JAMA. 2014 Jan 22-29; 311(4):378-84. Carpenter D. Can expedited FDA drug approval without expedited follow-up be trusted? JAMA Intern Med. 2014 Jan;174(1):95-7. Ciociola AA, Cohen LB, Kulkarni P; FDA-Related Matters Committee of the American College of Gastroenterology. How drugs are developed and approved by the FDA: current process and future directions. Am J Gastroenterol. 2014 May;109(5):620-3. Hughes JP, Rees S, Kalindjian SB, Philpott KL. Principles of early drug discovery. Br J Pharmacol. 2011 Mar; 162(6):1239-49. Bakema JE, van Egmond M. Fc receptor-dependent mechanisms of monoclonal antibody therapy of cancer. Curr. Top. Microbiol. Immunol. 2014;382:373-92. Brady D, Parker CC, O'Sullivan JM. Bone-targeting radiopharmaceuticals including radium-223. Cancer J. 2013 Jan-Feb; 19(1):71-8. Capra M, Nuciforo PG, Confalonieri S, Quarto M, Bianchi M, Nebuloni M, Boldorini R, Pallotti F, Viale G, Gishizky ML, et al. Frequent alterations in the expression of serine/threonine kinases in human cancers. Cancer Res. 2006 Aug 15;66(16):8147-54. Chen Y, Wang BC, Xiao Y. PI3K: a potential therapeutic target for cancer. J Cell Physiol. 2012 Jul;227(7):2818-21. Ciombor KK, Berlin J. Aflibercept--a decoy VEGF receptor. Curr Oncol Rep. 2014 Feb;16(2):368. Dhanasekaran N, Premkumar Reddy E. Signaling by dual specificity kinases. Oncogene. 1998 Sep 17;17(11 Reviews):1447-55. Dawson NA, Roesch EE. Sipuleucel-T and immunotherapy in the treatment of prostate cancer. Expert Opin Biol Ther. 2014 May;14(5):709-19. Dienstmann R, Markman B, Tabernero J. Application of monoclonal antibodies as cancer therapy in solid tumors. Curr Clin Pharmacol. 2012 May;7(2):137-45. Fu CH, Sakamoto KM. PEG-asparaginase. Expert Opin Pharmacother. 2007 Aug;8(12):1977-84. Gandhi V, Plunkett W, Cortes JE. Omacetaxine: a protein translation inhibitor for treatment of chronic myelogenous leukemia. Clin Cancer Res. 2014 Apr 1;20(7):1735-40. Levitzki A. Tyrosine kinase inhibitors: views of selectivity, sensitivity, and clinical performance. Annu Rev Pharmacol Toxicol. 2013;53:161-85. Norman P. Selective PI3Kδ inhibitors, a review of the patent literature. Expert Opin Ther Pat. 2011 Nov;21(11):1773-90. Ricks TK, Chiu HJ, Ison G, Kim G, McKee AE, Kluetz P, Pazdur R. Successes and Challenges of PARP Inhibitors in Cancer Therapy. Front Oncol. 2015 Oct 14;5:222. Sahebjam S, Siu LL, Razak AA. The utility of hedgehog signaling pathway inhibition for cancer. Oncologist. 2012;17(8):1090-9. Schuster SR, Kortuem KM, Zhu YX, Braggio E, Shi CX, Bruins LA, Schmidt JE, Ahmann G, Kumar S, Rajkumar SV, et al. The clinical significance of cereblon expression in multiple myeloma. Leuk Res. 2014 Jan;38(1):23-8. Seligmann J1, Twelves C. Tubulin: an example of targeted chemotherapy. Future Med Chem. 2013 Mar;5(3):339-52. Shah DR, Shah RR, Morganroth J. Tyrosine kinase inhibitors: their on-target toxicities as potential indicators of efficacy. Drug Saf. 2013 Jun;36(6):413-26. Stresemann C, Lyko F. Modes of action of the DNA methyltransferase inhibitors azacytidine and decitabine. Int J Cancer. 2008 Jul 1;123(1):8-13. Sun L, Coy DH. Somatostatin and its Analogs. Curr Drug Targets. 2014 Dec 5. Vergoulidou M. More than a Decade of Tyrosine Kinase Inhibitors in the Treatment of Solid Tumors: What We Have Learned and What the Future Holds. Biomark Insights. 2015 Oct 8;10(Suppl 3):33-40. West AC, Johnstone RW. New and emerging HDAC inhibitors for cancer treatment. J Clin Invest. 2014 Jan 2;124(1):30-9. Zhang J, Wu P, Hu Y. Clinical and marketed proteasome inhibitors for cancer treatment. Curr Med Chem. 2013;20(20):2537-51. Martell RE, Sermer D, Getz K, Kaitin K. Oncology drug development and approval of systemic anticancer therapy by the U.S. Food and Drug Administration. Oncologist. 2013;18(1):104-11. Alsop K, Fereday S, Meldrum C, deFazio A, Emmanuel C, George J, Dobrovic A, Birrer MJ, Webb PM, Stewart C et al. BRCA mutation frequency and patterns of treatment response in BRCA mutation-positive women with ovarian cancer: a report from the Australian Ovarian Cancer Study Group. J Clin Oncol. 2012 Jul 20;30(21):2654-63. Amado RG, Wolf M, Peeters M, Van Cutsem E, Siena S, Freeman DJ, Juan T, Sikorski R, Suggs S, Radinsky R, Patterson SD, Chang DD. Wild-type KRAS is required for panitumumab efficacy in patients with metastatic colorectal cancer. J Clin Oncol. 2008 Apr 1;26(10):1626-34. Cancer Genome Atlas Research Network. Integrated genomic analyses of ovarian carcinoma. Nature 2011; 474: 609–615. Corless CL, Heinrich MC. Molecular pathobiology of gastrointestinal stromal sarcomas. Annu Rev Pathol. 2008;3:557-86. Dietel M, Jöhrens K, Laffert M, Hummel M, Bläker H, Müller BM, Lehmann A, Denkert C, Heppner FL, Koch A et al. Predictive molecular pathology and its role in targeted cancer therapy: a review focussing on clinical relevance. Cancer Gene Ther. 2013 Apr;20(4):211-21. Dietel M, Jöhrens K, Laffert MV, Hummel M, Bläker H, Pfitzner BM, Lehmann A, Denkert C, Darb-Esfahani S, Lenze D et al. A 2015 update on predictive molecular pathology and its role in targeted cancer therapy: a review focussing on clinical relevance. Cancer Gene Ther. 2015 Sep;22(9):417-30. Doebele RC, Pilling AB, Aisner DL, Kutateladze TG, Le AT, Weickhardt AJ, Kondo KL, Linderman DJ, Heasley LE, Franklin WA et al. Mechanisms of resistance to crizotinib in patients with ALK gene rearranged non-small cell lung cancer. Clin Cancer Res. 2012 Mar 1;18(5):1472-82. Jabbour E, Kantarjian H. Chronic myeloid leukemia: 2014 update on diagnosis, monitoring, and management. Am J Hematol. 2014 May;89(5):547-56. Kan Z, Jaiswal BS, Stinson J, Janakiraman V, Bhatt D, Stern HM, Yue P, Haverty PM, Bourgon R, Zheng J et al. Diverse somatic mutation patterns and pathway alterations in human cancers. Nature. 2010 Aug 12;466(7308):869-73. Karapetis CS, Khambata-Ford S, Jonker DJ, O'Callaghan CJ, Tu D, Tebbutt NC, Simes RJ, Chalchal H, Shapiro JD, Robitaille S et al. K-ras mutations and benefit from cetuximab in advanced colorectal cancer. N Engl J Med. 2008 Oct 23;359(17):1757-65. Lee JH, Kim Y, Choi JW, Kim YS. Correlation of imatinib resistance with the mutational status of KIT and PDGFRA genes in gastrointestinal stromal tumors: a meta-analysis. J Gastrointestin Liver Dis. 2013 Dec;22(4):413-8. McCoach CE, Doebele RC. The minority report: targeting the rare oncogenes in NSCLC. Curr Treat Options Oncol 2014; 15: 644–657. Majewski IJ, Nuciforo P, Mittempergher L, Bosma AJ, Eidtmann H, Holmes E, Sotiriou C, Fumagalli D, Jimenez J, Aura C et al. PIK3CA mutations are associated with decreased benefit to neoadjuvant human epidermal growth factor receptor 2-targeted therapies in breast cancer. J Clin Oncol. 2015 Apr 20;33(12):1334-9. Martin V, Cappuzzo F, Mazzucchelli L, Frattini M. HER2 in solid tumors: more than 10 years under the microscope; where are we now? Future Oncol. 2014 Jun;10(8):1469-86. Miettinen M, Lasota J. Gastrointestinal stromal tumors. Gastroenterol Clin North Am 2013; 42: 399–415. Nishida T, Doi T, Naito Y. Tyrosine kinase inhibitors in the treatment of unresectable or metastatic gastrointestinal stromal tumors. Expert Opin Pharmacother. 2014 Oct;15(14):1979-89. Ou SH, Kwak EL, Siwak-Tapp C, Dy J, Bergethon K, Clark JW, Camidge DR, Solomon BJ, Maki RG, Bang YJ et al. Activity of crizotinib (PF02341066), a dual mesenchymal-epithelial transition (MET) and anaplastic lymphoma kinase (ALK) inhibitor, in a non-small cell lung cancer patient with de novo MET amplification. J Thorac Oncol. 2011 May;6(5):942-6. Pall G. The next-generation ALK inhibitors. Curr Opin Oncol. 2015 Mar;27(2):118-24. Powell CABE, Bubendorf L, Dacic S, Dziadziusko R, Geisinger K et al. Molecular testing for treatment selection in lung cancer. In: Travis WD, Brambilla E, Burke AP, Marx A, Nicholson AG (eds), WHO Classification of Tumours of the Lung, Pleura, Thymus and Heart. 4th edn. 2015; Lyon, pp 22–25. Rimawi MF, Schiff R, Osborne CK. Targeting HER2 for the treatment of breast cancer. Annu Rev Med. 2015;66:111-28. Roy R, Chun J, Powell SN. BRCA1 and BRCA2: different roles in a common pathway of genome protection. Nat Rev Cancer. 2011 Dec 23;12(1):68-78. Steer EJ, Cross NC. Myeloproliferative disorders with translocations of chromosome 5q31-35: role of the platelet-derived growth factor receptor Beta. Acta Haematol. 2002;107(2):113-22. Torres-Cabala CA1, Wang WL, Trent J, Yang D, Chen S, Galbincea J, Kim KB, Woodman S, Davies M, Plaza JA. Correlation between KIT expression and KIT mutation in melanoma: a study of 173 cases with emphasis on the acral-lentiginous/mucosal type. Mod Pathol. 2009 Nov;22(11):1446-56. Tremblay D, Carreau N, Kremyanskaya M, Mascarenhas J. Systemic Mastocytosis: Clinical Update and Future Directions. Clin Lymphoma Myeloma Leuk. 2015 Dec;15(12):728-38. Tronnier M, Mitteldorf C. Treating advanced melanoma: current insights and opportunities. Cancer Manag Res. 2014 Sep 10;6:349-56. Won E, Janjigian YJ, Ilson DH. HER2 directed therapy for gastric/esophageal cancers. Curr Treat Options Oncol. 2014 Sep;15(3):395-404. Zhang W. BRAF inhibitors: the current and the future. Curr Opin Pharmacol. 2015 Aug;23:68-73. 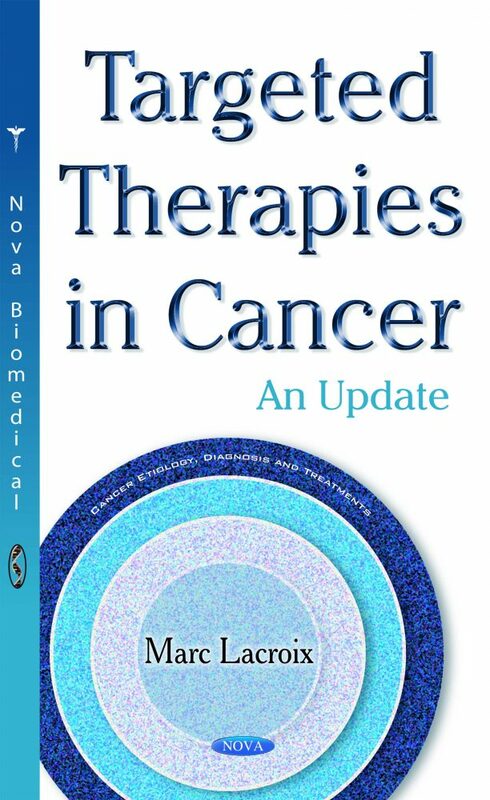 Audience: Academic level: the book is intended for MSc, MD, PhD’s and, more generally, to researchers in oncology. However, it may be of interest for people in pharmaceutical industry, since there is a continuous search for new gene-based targeted therapies.